There really is a time to celebrate anything. In fact, this month is Dental Implant Awareness Month, thus a great time to talk about the benefits of replacing a missing tooth. Our London, KY dentist team is very enthusiastic about this month as we know how great our patients feel when their smile is the best it can be. Watching patients see their new smile for the first time is an amazing experience and dental implants are just one of the ways we improve our patients’ smiles. To pay tribute to September’s Dental Implant Awareness Month, we’d like to discuss how dental implants might be right for your smile. Dental Implant Awareness Month is a time to educate people on implants. While a missing tooth might seem minor, especially if it doesn’t show when you smile, it actually causes some major problems. 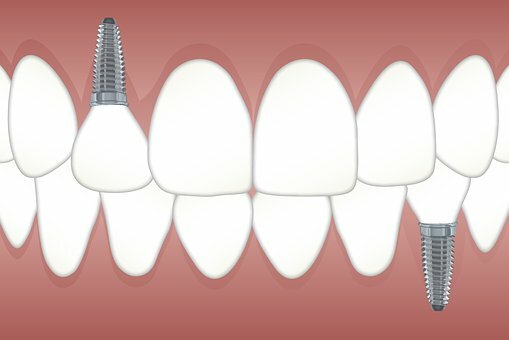 Dental implants replace missing teeth by using a post and a crown. The post is inserted or threaded into the bone and will act as the root of the tooth. The crown, then, is affixed to the post. The tooth’s crown, by definition is the area of the tooth above the gums that you can see. Crowns are designed to look like your natural teeth. Our London, KY dentist recommends implants as one of the best options for restoring smiles because they are easy to maintain and for their natural look. A missing tooth causes jaw pain and potential TMJ disorders. Also, it will make the rest of your teeth crooked. Overtime, the pressure you put on your teeth from biting and chewing will cause remaining teeth to move into the empty space. Before, they were supported and prevented from moving. Self-confidence takes a hit with a missing tooth and can lead to depression and lack of social engagement with peers and co-workers. Even your nutrition is at risk when a tooth is missing. Food isn’t broken down as well as it should be, thus affecting the level of nutrients your body is absorbing. Likewise, you may tend to not eat foods you should eat because the pain level is too high. By replacing the tooth with a dental implant, all these issues are avoided. Think of a ladder. If a rung is missing, the structure and support of the ladder is at risk. This is similar to your oral health. A missing tooth can affect not only your smile, but your health and oral health, too. There are more chances of acquiring cavities and developing gum disease. Additionally, the support your other teeth once had is now absent. If you wouldn’t climb a broken ladder, then you shouldn’t live with a missing tooth. Your oral health is put at risk when you’re missing even one tooth. Dental implants at our London, KY dentist office are a very simple procedure and a worthwhile investment in your smile. You’ll keep your mouth is great shape and prevent further damage to your oral health. For more ways to improve your health and smile, check out our Facebook page or schedule a consultation with our team. Let us educate you on dental implants and how they can change your smile.